"Yea, humble yourselves even as the people in the days of Melchizedek, who was also a high priest after this same order which I have spoken, who also took upon him the high priesthood forever." Alma 13 concludes the words of Alma to the apostate Nephites of the city of Ammonihah. Alma’s discourse mainly focused on repentance, a subject which he had been commanded by the Lord, through the voice of an angel, to preach to the people of that city (Alma 8:16). However, in chapter 13 Alma began to speak about the priesthood and about Melchizedek. Alma’s words are among the most spiritually moving in all of scripture concerning this important high priest who brought forth bread and wine and blessed the patriarch Abraham, from whom he received tithes (Genesis 14:18–20).1 Alma brilliantly used Melchizedek as his primary model of righteous priestly influence. Although this information about Melchizedek may seem out of place to modern readers, it masterfully drives Alma’s message home to his audience. Today, we likewise need the saving ordinances of the Melchizedek priesthood to gain salvation. By attending the temple and fulfilling our covenants to God, we can participate in ordinances of the Melchizedek priesthood "after the order of his Son" to bring us closer to God. 1. Other accounts of Melchizedek in ancient scripture can be found in Genesis 14:17–24 (see also, notably, JST Genesis 14:17–40); Psalm 110:4 (Alma seems to be familiar with both the Genesis and Psalms passages); and Hebrews 7. For comparisons between Alma’s depiction and other ancient sources, see John W. Welch, “The Melchizedek Material in Alma 13:13–19,” in By Study and Also by Faith, 2 vols. ed. John M. Lundquist and Stephen D. Ricks (Salt Lake City and Provo, UT: Deseret Book and FARMS, 1990), 2:238–272. 2. Book of Mormon Central, “What Did Alma Teach about the Temple? (Alma 12:30),” KnoWhy 119 (June 10, 2016). Further evidence of temple themes can be seen in Alma’s use of the temple pilgrimage song, Psalm 95. Alma 12:35–37 borrows from Psalm 95:8, 11 and Alma 13:6 uses a phrase from Psalm 95:11. Compare with Jacob’s similar usage in a temple context; Jacob 1:7 (Psalm 95:8, 11); 6:6 (Psalm 95:7–8); see Book of Mormon Central, “Why Does Jacob Quote So Much from the Psalms? (Jacob 1:7),” KnoWhy 62 (March 25, 2016). 3. See, e.g., Psalms 2:2, 6–7, 12; 89:27; 110:1–4; these psalms almost certainly described parts of temple rituals involving the Israelite monarch. See Margaret Barker, Temple Theology: An Introduction (London: SPCK, 2004), 4–5, 24. 4. Starting in Alma 13:14. 5. The book of Mosiah gave considerable attention to the issue of priesthood authority, as was discussed in Book of Mormon Central, “Why Does the Book of Mosiah Talk So Much about Priesthood Authority? (Mosiah 23:17),” KnoWhy 101 (May 17, 2016). The record repeatedly stated that both Alma the Elder, as well as his son Alma after him, acted with “authority from God” (See, e.g., Mosiah 13:6; 18:13, 17, 18, 26; 21:33; 23:16–17; 26:7–8; 29:42). 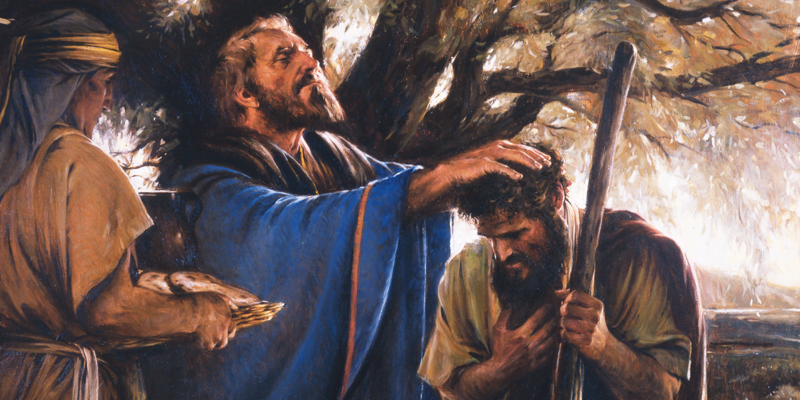 Due to the recent experiences that the Nephites had with the unrighteous use of authority, the book of Mosiah emphasized the need for men to repent and commit themselves to the service of the Lord in righteousness in order to exercise the power and authority of the priesthood. For more on Nehor and his preaching, see Book of Mormon Central, “Why Did Nehor Suffer an ‘Ignominious’ Death? (Alma 1:15),” KnoWhy 108 (May 26, 2016).